Professor David Vaughan is the Director of Science with responsibility for the strategic development and excellence in scientific output of the Science teams employed by the British Antarctic Survey. He Chairs the BAS Science Strategy Team and is a member of NERC Science Board. In 2017 he was made an Officer of the Order of the British Empire in recognition of his services to science. 2009-2014: Science Leader for the British Antarctic Survey core programme: IceSheets. This programme employed ~17 full-time researchers, and additional postgraduate students funded by NERC National Capability and grant funding. The programme had research strands in: Ice-sheet modelling, terrestrial and marine geology/geochemistry, satellite remote sensing, airborne and surface geophysical investigation, technology development. 2009 – 2013: Coordinator for ice2sea, a large-scale research programme funded by the European Union involving 24 institutions. The role of ice2sea was to reduce uncertainty in the projections of the contribution of melting ice to sea-level rise. 2005-2010: Principal Investigator for British Antarctic Survey Core Programme: Glacial Retreat of Antarctica and Deglaciation of the Earth System (GRADES).  GRADES employed between 12 and 20 staff and focus on aspects of past and future deglaciation as drivers of change in the Earth System. 1999-2005: Principal Investigator for BAS Core Programme Global Interactions of Antarctic Ice Sheet (GIANTS). This five-year project employed between 10 and 15 staff, and focused on the interactions between the Antarctic ice sheet and its bed, surrounding oceans, climate and volcanoes. 1986-1990: Remote sensing specialist, Ice and Climate Division, British Antarctic Survey. 1986-1990: Glaciologist, Ice and Climate Division, British Antarctic Survey. 1992-1995: Open University. Ph.D. Thesis title, Structural and climatic controls on Antarctic Ice Shelves. Supervisors, Dr. C.S.M. Doake; Professor D. Sugden, University of Edinburgh. Before-1981: Yateley Comprehensive School and Ivybridge School and Community College. Personal research interests include glaciology, climate and sea-level rise, the role of ice in the Earth system and the societal implications of climate change and rising sea levels. I have collaborated with many scientists from the UK and overseas. Vaughan, David. (2014) [June 14]. In: Global chorus: 365 voices on the future of the planet, Rocky Mountain Books, 432 pp. Vaughan, David. (2014) A fluid situation. Pan European Networks, 10. 164-165. Vaughan, David. (2013) Uncertain sea levels (Letter). New Scientist, 218. 32-32. Alexander, Lisa V., Allen, Simon K., Bindoff, Nathaniel L., Bréon, François-Marie, Church, John A., Cubasch, Ulrich, Emori, Seita, Forster, Piers, Friedlingstein, Pierre, Gillett, Nathan, Gregory, Jonathan M., Hartmann, Dennis L., Jansen, Eystein, Kirtman, Ben, Knutti, Reto, Kanikicharla, Krishna Kumar, Lemke, Peter, Marotzke, Jochem, Masson-Delmotte, Valérie, Meehl, Gerald A., Mokhov, Igor I., Piao, Shilong, Plattner, Gian-Kasper, Qin, Dahe, Ramaswamy, Venkatachalam, Randall, David, Rhein, Monika, Rojas, Maisa, Sabine, Christopher, Shindell, Drew, Stocker, Thomas F., Talley, Lynne D., Vaughan, David G., Xie, Shang-Ping. (2013) Summary for policymakers. In: Climate Change 2013: The physical science basis. Contribution of Working Group I to the Fifth Assessment Report of the Intergovernmental Panel on Climate Change, Cambridge, Cambridge University Press, 3-29. Vaughan, David G., Comiso, Josefino C., Allison, Ian, Carrasco, Jorge, Kaser, Georg, Kwok, Ronald, Mote, Philip, Murray, Tavi, Paul, Frank, Ren, Jiawen, Rignot, Eric, Solomina, Olga, Steffen, Konrad, Zhang, Tingjun. (2013) Observations: Cryosphere. In: Climate Change 2013: The physical science basis. Contribution of Working Group I to the Fifth Assessment Report of the Intergovernmental Panel on Climate Change, Cambridge, Cambridge University Press, 317-382. Vaughan, David. (2012) The ice sheet. In: Antarctic Peninsula. A visitor's guide, London, Natural History Museum, 52-63. Rippin, D.M., Vaughan, David G., Corr, Hugh F.J.. (2011) The basal roughness of Pine Island Glacier, West Antarctica. Journal of Glaciology, 57. 67-76. Bindschadler, Robert, Vaughan, David G., Vornberger, Patricia. (2011) Variability of basal melt beneath the Pine Island Glacier ice shelf, West Antarctica. Journal of Glaciology, 57. 581-595. Scott, Julian, Smith, Andrew, Bingham, Robert, Vaughan, David. (2010) Crevasses triggered on Pine Island Glacier by drilling through an exceptional melt layer. Annals of Glaciology, 51. 6 pp. Pritchard, H.D., Arthern, R.J., Vaughan, D.G., Edwards, L.A.. (2009) Extensive dynamic thinning on the margins of the Greenland and Antarctic ice sheets. Nature, 461. 971-975. Karlsson, Nanna B., Rippin, David M., Vaughan, David G., Corr, Hugh F.J.. (2009) The internal layering of Pine Island Glacier, West Antarctica, from airborne radar-sounding data. Annals of Glaciology, 50. 141-146. McMillan, Malcolm, Shepherd, Andrew, Vaughan, David G., Laxon, Seymour, McAdoo, David. (2009) Amundsen Sea bathymetry: The benefits of using gravity data for bathymetric prediction. IEEE Transactions on Geosciences & Remote Sensing, 47. 4223-4228. Vaughan, David. (2009) Ice sheets: indicators and instruments of climate change. In: Climate Change, Oxford, Elsevier, 492 pp. Murray, Tavi, Ian, Rutt, Vaughan, David G.. (2008) The heat is on. Physics World, 21. 24-29. Vaughan, David G.. (2008) Ice/ocean interactions: urgent questions for AUVs. In: Workshop on AUV science in extreme environments: collaborative Autosub science in extreme environments, London, Society for Underwater Technology, 15-19. Anisimov, O., Vaughan, David G., Callaghan, T.V., Fural, C., Marchant, H.J., Prowse, T.D., Vilhjalmsson, H., Walsh, J.E.. (2007) Polar regions (Arctic and Antarctic). In: Climate change 2007 - impacts adaptations and vulnerability. Contribution of Working Group II, Cambridge, Cambridge University Press, 653-685. Vaughan, David G. (2007) Antarctic ice sheet: definitions and description. In: Encyclopedia of the Antarctic, New York, Routledge, 56-59. Vaughan, David G.. (2006) Antarctica and climate change – implications for governance. In: Confronting climate change: critical issues for New Zealand, Wellington, New Zealand, Victoria University Press, 83-92. Vaughan, David G.. (2006) The Antarctic ice sheet. In: Glacial science and environmental change, Malden, Mass., Blackwell, 209-220. Vaughan, David G.. (2006) Recent trends in melting conditions on the Antarctic Peninsula and their implications for ice-sheet mass balance and sea level. Arctic, Antarctic, and Alpine Research, 38. 147-152. Vaughan, David. (2003) From Port Stanley, 4th April, 2003. Planet Earth, Summer 2003. 14-16. Anisimov, Oleg, Fitzharris, Blair, Hagen, J.O., Jefferies, R., Marchant, H., Nelson, F., Prowse, T., Vaughan, D.G.. (2001) Polar regions (Arctic and Antarctic). In: Climate change 2001: impacts, adaptation, and vulnerability. Contribution of Working Group II., Cambridge, Cambridge University Press, 801-841. Vaughan, David G., Smith, Andrew M., Corr, Hugh F.J., Jenkins, Adrian, Bentley, Charles R., Stenoien, Mark D., Jacobs, Stanley S., Kellogg, Thomas b., Rignot, Eric, Lucchitta, Baerbel K.. (2001) A review of Pine Island Glacier, West Antarctica: hypotheses of instability vs. observations of change. In: The West Antarctic Ice Sheet: Behavior and environment, Washington, D.C., American Geophysical Union, 237-256. (Antarctic Research Series, ). Vaughan, D.G.. (2001) A day in the life of a glaciologist. In: Blue Peter Earth watch, London, Dorling Kindersley, 16-17. Smith, A.M., Vaughan, D.G., Doake, C.S.M., Johnson, A.C.. (1998) Surface lowering of the ice ramp at Rothera Point, Antarctic Peninsula, in response to regional climate change. Annals of Glaciology, 27. 113-118. Vaughan, David G., Bamber, Jonathan L.. (1998) Identifying areas of low-profile ice sheet and outcrop damming in the Antarctic ice sheet by ERS-1 satellite altimetry. Annals of Glaciology, 27. 1-6. Jenkins, Adrian, Vaughan, David G., Jacobs, Stanley S., Hellmer, Hartmut H., Keys, John R.. (1997) Glaciological and oceanographic evidence of high melt rates beneath Pine Island Glacier, West Antarctica. Journal of Glaciology, 43. 114-121. Goodwin, A.H., Vaughan, D.G.. (1995) A topographic origin for double-ridge features in visible imagery of ice divides in Antarctica. Journal of Glaciology, 41. 483-489. Jenkins, Adrian, Vaughan, David G., Doake, C.S.M.. (1994) Numerical modelling of Filchner-Ronne Ice Shelf. Filchner-Ronne Ice Shelf Programme Report, 8. 36-38. Vaughan, David. (1994) Glacier geophysics fieldwork on Ronne Ice Shelf in 1992/1993. Filchner-Ronne Ice Shelf Programme, 7. 37-38. Vaughan, David G., Frolich, R.M., Doake, C.S.M.. (1994) ERS-1 SAR: stress indicator for Antarctic ice streams. In: Space at the service of our environment. Proceedings of the Second ERS-1 Symposium, Hamburg, October 1993, Paris, European Space Agency, 183-186. (ESA Sp, ). Doake, Christopher, Vaughan, David, Mantripp, David, Sievers, Jorn, Thyssen, Franz. (1993) Preliminary evaluation of ERS-1 altimetry over Filchner-Ronne Ice Shelf, Antarctica. In: Proceedings of the First ERS-1 Symposium - Space at the Service of our Environment, Cannes, France, November 1992,, Paris, European Space Agency, 259-261. (ESA SP, ). Vaughan, D.G.. (1993) Chasing the rogue icebergs. New Scientist, 137. 24-27. Morris, E.M., Vaughan, D.G.. (1992) Snow surface temperatures in West Antarctica. In: The contribution of Antarctic Peninsula ice to sea level rise: report for the Commission of the European Communities project EPOC-CT90-0015, Cambridge, British Antarctic Survey, 17-24. (Ice and climate special report, ). Vaughan, David G.. (1992) The ice shelves of the Antarctic Peninsula: changing climate and sea level. In: The contribution of Antarctic Peninsula ice to sea level rise. Report for the Commission of the European Communities Project EPOC-CT90-0015, Cambridge, British Antarctic Survey, 35-44. (Ice and Climate special report, ). Vaughan, David G., Doake, C.S.M.. (1992) The use of visible satellite imagery over ice sheets. In: TERRA-1: understanding the terrestrial environment. The role of Earth observations from space, London, Taylor and Francis, 9-20. Doake, C.S.M., Vaughan, David G.. (1991) Breakup of the Wordie Ice Shelf, Antarctica. In: Glaciers-ocean-atmosphere interactions. Proceedings of the international symposium, St Petersburg, September 1990, Wallingford, International Association of Hydrological Sciences, 161-165. (IAHS publication, ). Morris, E.M., Vaughan, David D.. (1991) Glaciological measurements on the south Ronne Ice Shelf. Filchner-Ronne Ice Shelf Programme Report, 5. 37-44. Vaughan, David G., Doake, C.S.M., Mantripp, D.R.. (1991) Thematic maps of Filchner-Ronne Ice Shelf. Filchner Ronne Ice Shelf Programme Report, 5. 8-11. Whillans, I.M., Bolzan, J., Nye, J.F., Vaughan, David G.. (1991) Science rationale – glaciology. In: GPS in Antarctica, Columbus, Ohio, Byrd Polar Research Center, 7-10. (BPRC Technical Report, ). Vaughan, David G., Doake, C.S.M., Mantripp, D.R.. (1988) Topography of an Antarctic ice stream. In: Centre National d'Etudes Spatiales. SPOT 1 utilisation des images, bilan, resultats. SPOT 1 image utilization, assessment, results, Toulouse, Cepadues-Editions, 167-174. Frolich, R.M., Mantripp, D.R., Vaughan, David G., Doake, C.S.M.. (1987) Force balance of Rutford Ice Stream, Antarctica. In: The physical basis of ice sheet modelling. Proceedings of an international symposium, XIXth General Assembly of the IUGG, Vancouver, British Columbia, August 1987, Wallingford, International Association of Hydrological Sciences, 323-331. (IAHS publication, ). In 2017 Professor David Vaughan was awarded an OBE, for services to glaciology. 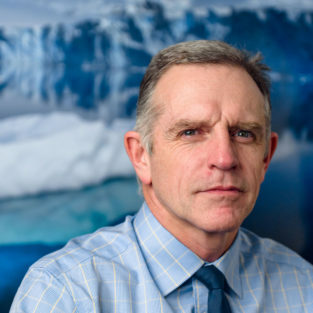 Professor Vaughan is director of science at the British Antarctic Survey and the foremost UK expert on understanding the response of ice sheets in the polar regions to climate change. He served as co-ordinating lead author in two rounds of the Intergovernmental Panel on Climate Change assessment reports and was responsible for identifying the policy-relevant issues and negotiating the acceptance of key findings by high-level policymakers.